Messy Messy Fail - I really enjoy decorating for the season/holiday, and after Christmas I put up snowmen (I collect them), yet they have yet to be displayed. Therefore, my shelves are naked. Tidy Victory - the toddler's potty training is making huge gains lately, at the expense of washing 5-10 pair of underpants a day, but I think that's a HUGE gain! Even if it takes chips and Bison dip as our positive reinforcement (we brush our teeth twice a day!). I wish I had kept better track of this, but I THINK I starting looking at blogs about halfway through my pregnancy with the baby. Let's say that was the fall of 2013. I am a traveling teacher, sometimes switching between buildings three times a day. I remember just being EXHAUSTED at the end of the day when I was preggo, carrying all that extra weight around and still attempting to climb the two GINORMOUS flights of stairs to my orchestra room on the second floor of the high school. So after a very long day, I'd prop my feet up on the couch and start searching for some easy reading online. 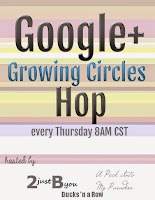 The very first blog I came across that I immediately enjoyed was with Kate and her blog - The Small Things Blog. 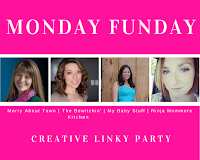 This blog has evolved over the years from being mainly about hair & makeup to more posts about her family, crafty things and just everyday life as a newer stay-at-home mom with a one-year-old and a new one on the way. I was intrigued by her hairstyle TUTORIALS (I love saying that word out loud, is that weird?) and descriptions of makeup colors and such. I loved it! 1. The Pioneer Woman - my all time favorite read. Filled with her delicious recipes with AMAZING pictures as well as tales from her life on the ranch in the middle of nowhere. I watch her cooking show religiously and love everything that she wears, especially her amazing earrings! I also love her passion for home teaching and everything that she shares about her experience with it. 3. The Farmer's Wife - witty witty witty! Basic blog about her family's life on the farm, makes me smile every time! 4. Iheartorganizing - my go to for organizing inspiration. She features a lot of large scale projects that I would most likely NEVER try, but it's still fun to read about how she does it! 5. Scary Mommy - I just cannot stop laughing. Warning - you MUST have a sense of humor to read this or you WILL be offended, so lighten up! Honorable mentions - Momastery - her one post about being grateful will always stay with me; Coordinately Yours - I wish everything in my house could be white like hers, has some really nice gift ideas; The Rosie Report - really fun to read while I was pregnant because that was ALL I had on my mind at the time for obvious reasons. Thinking of starting your own blog? The common thread that all bloggers have is their desire to SHARE their passion with others, so if you feel the same way, do your research and GO FOR IT! Whether it's just a fun hobby like mine or your livelihood, you'll never know how it goes unless you try. Enjoy the weekend, we hope to be out snowmobiling! Tidy Victory - I went on an organizational binge to tidy up our CD's and DVD's crammed into the shelving of the entertainment center. Now the toddler is no longer tempted to play frisbee with the disks that were scattered about! As we are watching our final viewing of Frosty the Snowman, one of my favorites, I was inspired to make a list of my five favorite holiday programs/movies that are especially fun to watch during the festive season. We were able to record several of these on our DVR for our kids to watch (or maybe it was more for us?) and they bring back so many memories. <Five> A Charlie Brown Christmas - these lovely characters just make me smile and my toddler giggle whenever Snoopy makes that weird squawky noise and Woodstock gets flustered. <Four> A Christmas Story - not only does this movie have some of the most memorable characters and adventures (the Bumpus hounds!) but has a somewhat local tie! Many of these scenes were shot at a house in the nearby city of Cleveland, OH, and my husband and I were able to visit last summer. So crazy walking through the house where Ralphie opened up his pink bunny suit! <Three> Frosty the Snowman - apparently the toddler's new favorite, he cries for Frosty almost every night. Happy birthday! <Two> National Lampoon's Christmas Vacation - my husbands favorite, he even has a Fargo hat so he looks like Cousin Eddie when he's out shoveling! <One> How the Grinch Stole Christmas (the cartoon!) - nothing makes me giggle more then listening to the narrator tell the story of a creature with a lonely heart who is moved by the Christmas spirit. Honorable mentions - Rudolph the Red-Nosed Reindeer (Bumble & Yukon Cornelius, "His beak blinks like a blinking beacon! "), Home Alone (I never laughed so hard the first time I saw that movie in the theater), Twas the Night Before Christmas, Elf (we ate syrup on everything before we saw this movie), The Grinch Who Stole Christmas (Jim Carrey WAS the Grinch) and finally a Nightmare Before Christmas (the toddler would sing "Here comes Halloween, Halloween, Halloween!" in the different voices). Remember people - it's good to keep the television turned off, but a classic show to share with the whole family is a-okay in my book! What are your favorite holiday programs? Check these out next year with your loved ones! Labels: entertainment , Oh hey Friday! Tidy Victory - I'd say about half of our bedroom, aka my pre-maternity, maternity and post-maternity clothes strewn around the place, were cleaned up and packed away in drawers, the closet, bins in the basement. We can see the floor now! 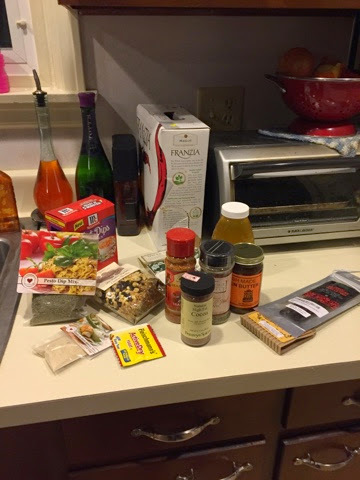 So, I did it - the spice "black hole" has been tamed! 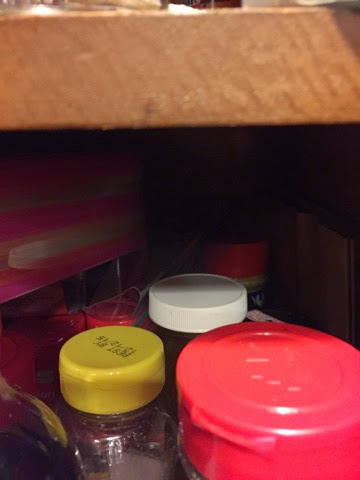 No joke, it is literally so dark in the cabinet that you can't see the back of it, and it's not deep at all. So sad. 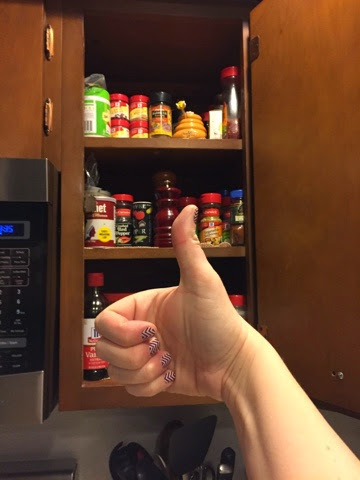 Some friends on Facebook gave me some great suggestions for cabinet spice rack organizers, which I would LOVE to try. 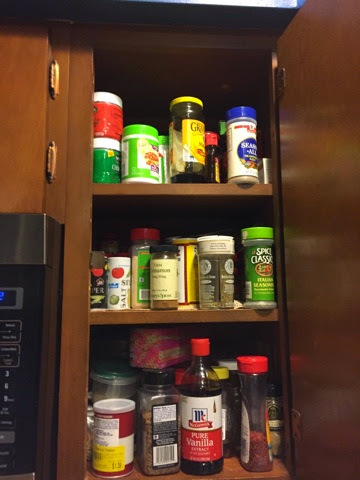 However I was in such a hurry, and I wanted to cross at least ONE of my goals off of my list for my break, so no cabinet spice rack organizer for me. Perhaps next Christmas? Here are some thrilling before, during and after shots I took to document my journey. 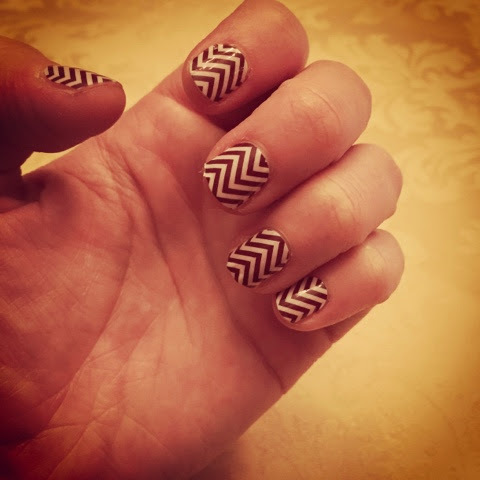 I should have been getting dinner ready (notice the time) but I decided to do this instead. The key word to this mess was SHOVE - I would SHOVE something here and SHOVE something there, SHOVE things where ever they would fit. Here is the "black hole". Absolutely no rhyme or reason. Looks like it's feet deep, but it's probably only 12 inches. 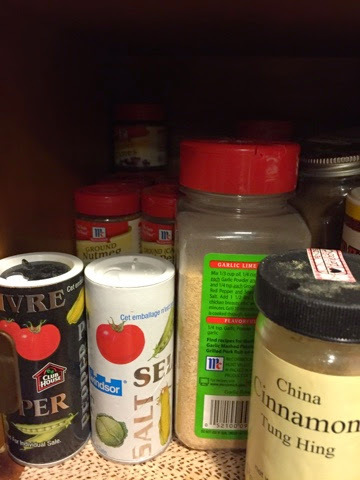 Yes, that is Tung Hing Cinnamon from China that someone gave me as a gift, highly recommend it, from Penzey Spices. 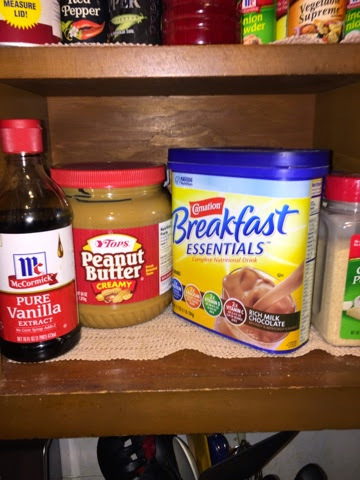 Great for baking! 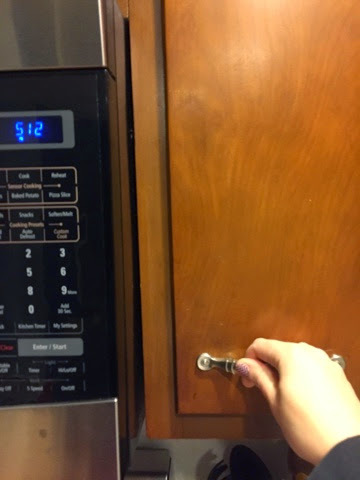 Flash on, there's the back of the cupboard! 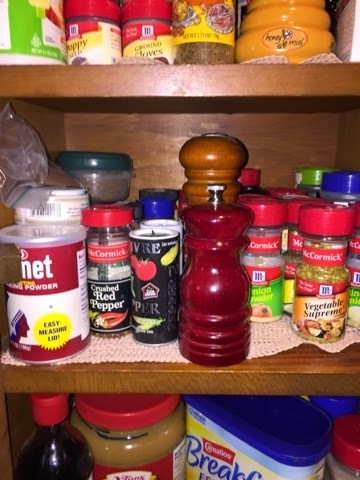 So to start - I took everything out of the cabinet and gave it a good Dust Bust. 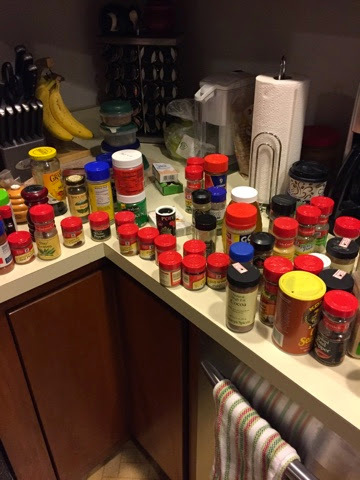 Anyone else want to admit they have as many spices as me? 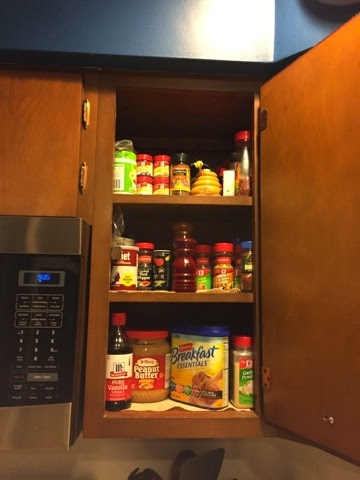 Anything that was not already opened I separated and placed in the pantry downstairs (see Goal No. 3 from Goals for a Teacher's Christmas Vacation that has not quite happened yet). Yes that is boxed wine back there. Do not judge. 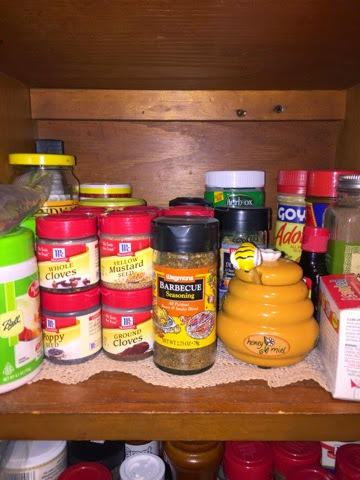 I also consolidated any spices from the cabinet that I had a container for into my counter top spice rack. 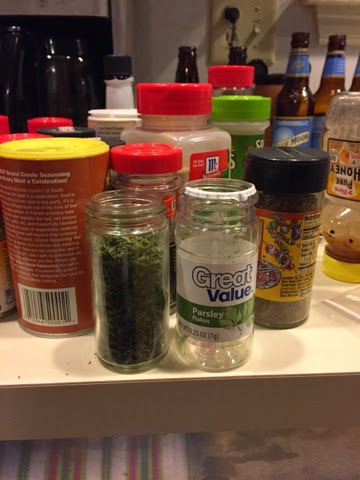 I'm not one for checking dates on spices - dried parsley is dried parsley. Now it's hard to get the full effect, but here is the finished product! I categorized everything that was left into one of three - hardly use, use sometimes, use often. 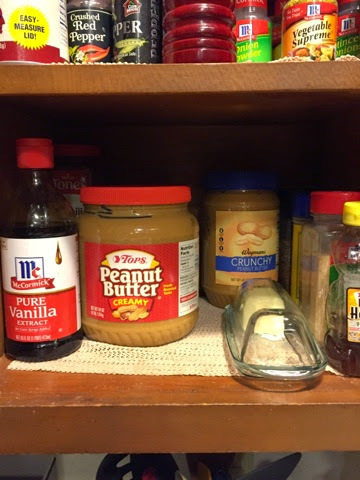 I even had extra room now to take the economy size peanut butter and Carnation Instant Breakfast out of my lazy susan and put it on the bottom shelf! Ta-da! Beautiful, organized, goal accomplished! 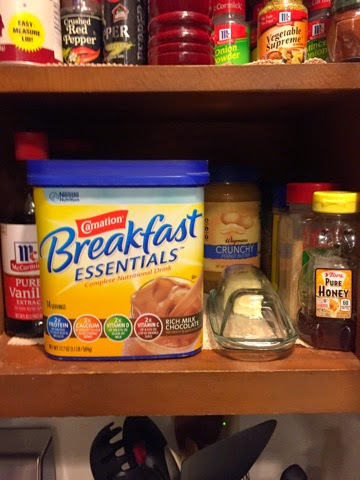 One little change - my husband and I like to have soft butter ready when a recipe calls for it, but my two lovely cats have helped themselves to it several times when it was left out on a counter top, even a shattered butter dish. 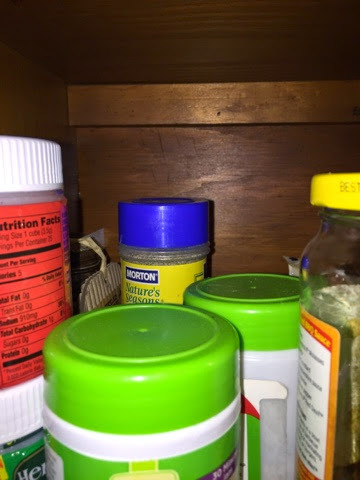 Now it fits perfectly on the bottom shelf! 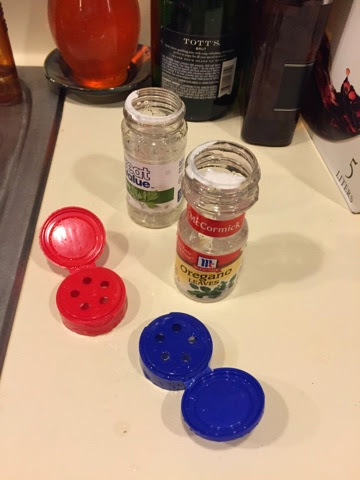 Don't forget to recycle your empty containers people! Goal accomplished. What next? I think I'll watch an episode of the Pioneer Woman to treat myself! Messy Messy Fail - had some friends come over for a brunch and I didn't let the Cinnamon Roll Cake bake long enough - slightly mushy in the middle still! However we had no problem eating it still. In celebration of such a lovely holiday season this year, I shall make a list of 5+ ways that you know you had a smashingly successful holiday. I will include pictures where appropriate. <One> Your kids enjoy watching their new toys CHARGE UP as much as they love playing with them. 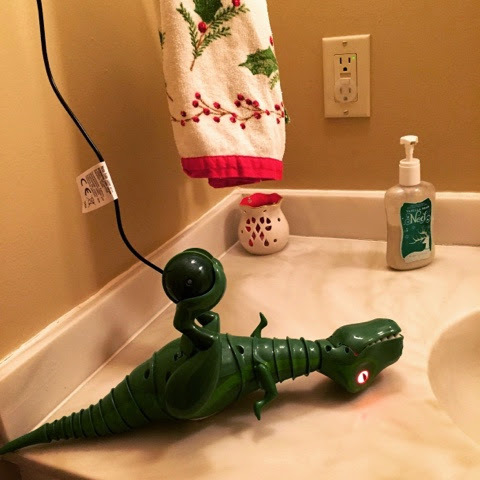 "Buddy, what are you doing in the bathroom?" "Mom Mom, I'm waiting for his eyes to turn green." <Two> Your husband is EXCITED to go shopping with you to purchase/return/exchange gifts (sans kids). <Three> You didn't feel like a complete sloth when you realized you literally stayed in your pajamas ALL DAY LONG. How easy to get ready for bed now! <Four> You gained AT LEAST 7.5 pounds. 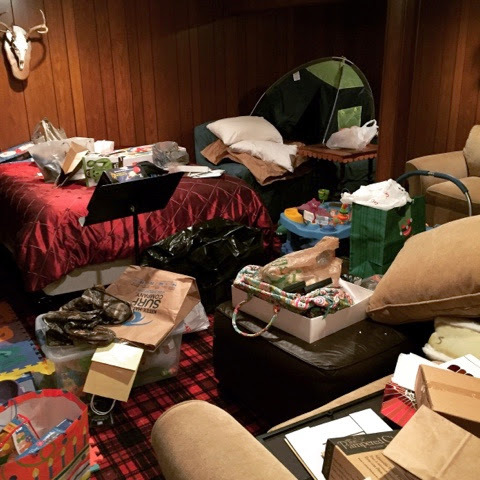 <Five> Christmas threw up (see previous post A Teacher's Christmas Vacation Goals, goal number 4) in your finished basement and you are at peace with that. <Six> You've been eating Christmas dinner leftovers since Christmas and they still taste PHENOMENAL. <Seven> You've been eating Christmas cookies since Christmas and they still taste PHENOMENAL. I hope everyone had a lovely holiday with your friends & families and welcome to the new year - 2015 here we go! New year - new jams! Labels: holidays , Oh hey Friday! Messy Messy Fail - I'm being eaten alive by laundry prior to leaving for our three Christmases. Tidy Victory - Before returning home from our third Christmas with our families, I washed everything save a few pieces of laundry at my MIL's house. When packing up to go home, I put all of the clean laundry in the suitcases first, put a layer of a few plastic grocery bags over the clean clothes, then put the dirty clothes on top of the plastic bags. That way I can throw the dirty clothes right into the laundry when we get home cause they are right on top AND they don't touch the clean clothes, which will now sit in the suitcases until I put them away :) I still think my plastic bag idea is pretty smart.